The TM-U220 not only has the same reliability as the popular TM-U200, but also comes with enhanced features. It is 30% faster then the U200, has 4K buffer vs the original 1K, comes with a universal power supply, and now includes a 2 year warranty. The TM-U220 also includes adjustable paper widths, real drop-in paper loading, and "near end paper" and "paper out" sensors. 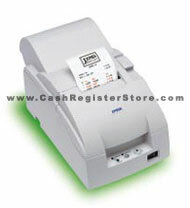 Yes, the TM-U220 is an ideal low cost printer for point-of-sale applications. Epson's world renowned quality and reliablity are reflected in every component and mechanism of the TM-U220, ensuring products unsurpassed in performance and dependability.